Hi everyone! I am already finished with the first week back at school! We are gearing up for the eclipse on Monday! Our building is in the "totality zone" so we are expecting Monday to be quit crazy with traffic! We have our glasses ready! Hoping for a sunny day! Spotlight: Our spotlight of the week is Kim of Champagneista! How perfect is the the top that Kim is rocking! 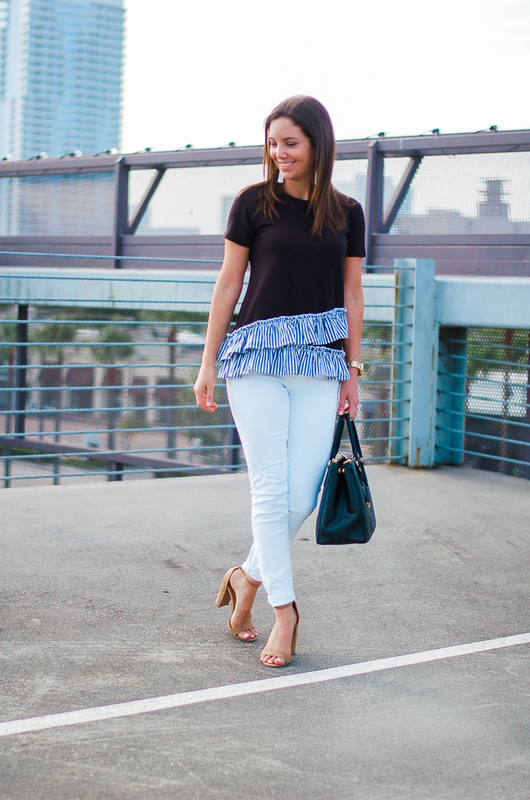 The ruffles are the perfect detail to this look! Be sure to check out her blog! Simple, sweet and OLIVE LOVE...fantastic pants. Leopard adds so much cuteness too you pretty girl!! Love simple classic looks like this, perfect for everyday! This is why I love shoes so much--just look at how those leopard flats are the cat's meow with that outfit!! That bag is so cute! Love this classic look! Peace! How exciting you are in the totality zone for the eclipse! That will be neat to see! 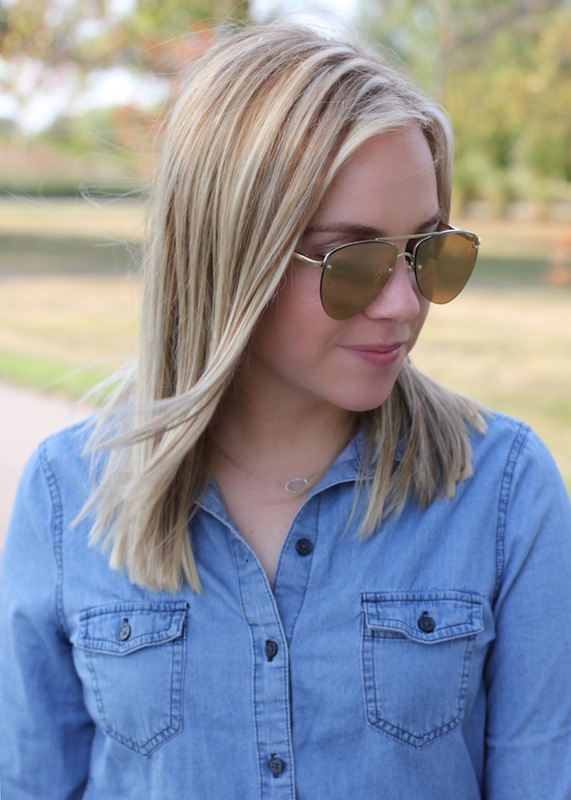 Love this fall transition outfit! A chic, classic look! 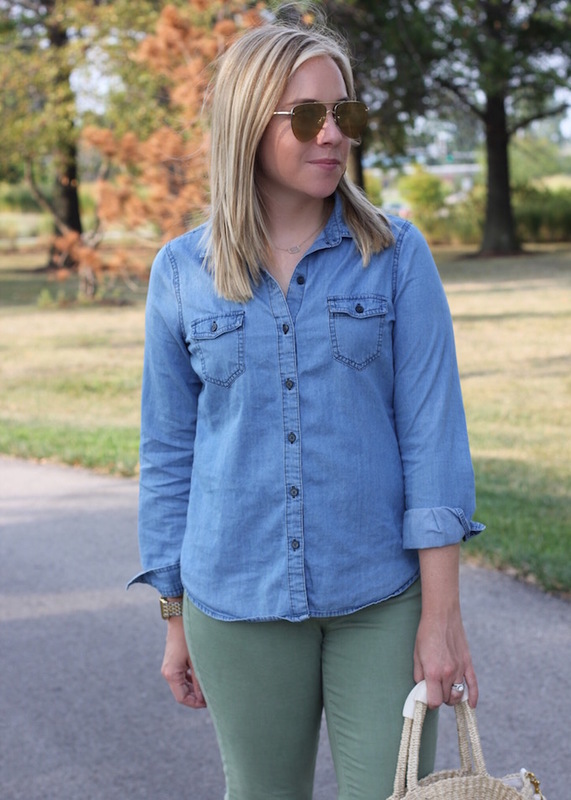 Love the chambray top paired with olive! A great combo! That bag is the cutest! Love this casual look! I love those pants, that is such a unique shade of green. Hope you get a great view of the eclipse! 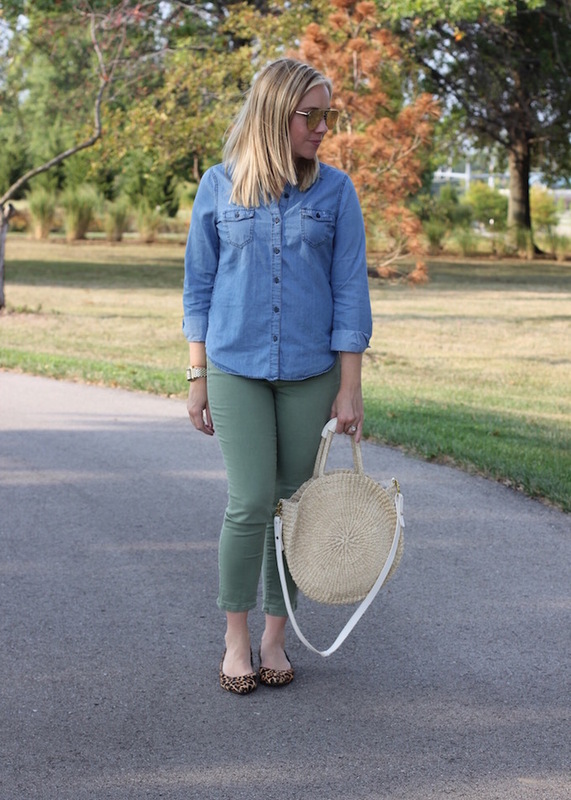 Love the olive and chambray! This outfit is something I could just wear over and over! I'm excited for the cooler weather, because I miss my chambray shirts that are just too hot most days right now! I really love that color of pants! Enjoy the eclipse time! Love the outfit! Nice tones! Congrats on finishing up your first week! I can't believe it's that time already! We go back in a few more weeks! Eek! 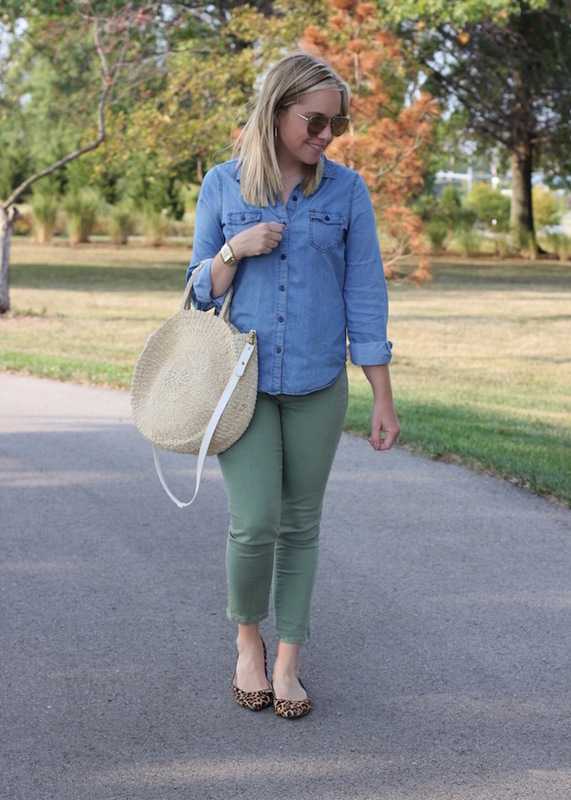 I love the mix of chambray and olive! Such a perfect, casual look! I love how simple yet so elegant this look is! 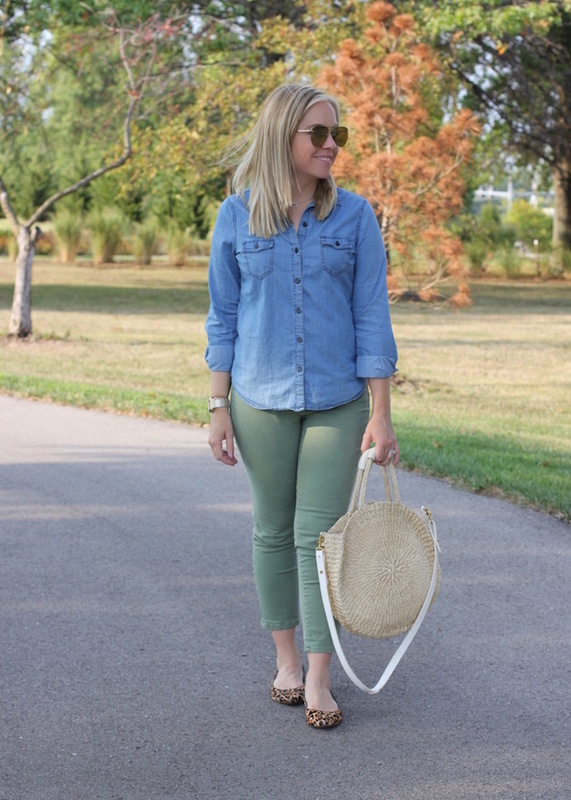 The chambray with the olive pants is a great combo!